Does Kenya have too many MPs? An article in the Daily Nation asked this provocative question. In the article, the author examined the cost per capita of legislatures in several countries; and concluded that legislatures in OECD democracies tend to be relatively more representative (seats/million people) as well as cost effective (per capita cost/east) than their counterparts in the developing world. Of course, linking per capita income to the density of representation has its pitfalls. An assumption that countries with smaller economies should have smaller assemblies, regardless of population size, implicitly undervalues the political voice (and rights) of citizens of poor countries. At the same time, setting an arbitrary upper bound on the remuneration of legislators (and general resourcing of legislatures) has the potential to limit the continued professionalization of legislatures in emerging democracies. Under-resourced legislatures find themselves in a bad equilibrium of high turnovers, weak institutionalization (lack of experience), inability to check the executive or effectively legislate, and a whole lot of dissatisfied voters who invariably choose to go with erstwhile challengers. The standard metric in Political Science for comparing the density of representation was developed by Rein Taagepera in the early 1970s. The Taagepera formula predicts that assembly sizes tend to approximate the cube root of the total population of states. 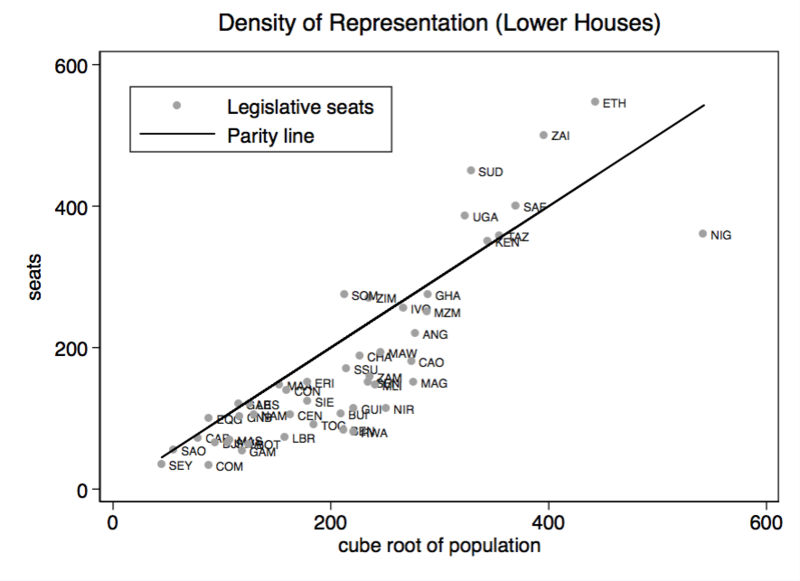 In the dissertation I looked at how African states faired according to this metric (see figure) and found that the vast majority of countries on the Continent have relatively smaller assemblies than would be predicted by their population sizes (the figure only captures the sizes the lower houses). Somalia, Uganda, Sudan, the DRC, South Africa, and Ethiopia are the clear outliers. Incidentally, Kenya’s National Assembly is right on the parity line. The usefulness of this metric (at the national level) diminishes beyond a certain population size. For countries with hundreds of millions of people or more, it makes more sense to apply the formula with respect to sub-national assemblies, if they exist. This is for the simple reason that beyond a certain number of seats the legislature would become too big to reasonably be able to conduct its business (see Nigeria).